Today (Wednesday, Jan. 17), the U.S. Environmental Protection Agency (EPA) identified the Eagle Mine Superfund site in Eagle County, Colo. as among 31 current and former National Superfund Priorities List (NPL) sites with the greatest expected redevelopment and commercial potential. EPA’s redevelopment focus list includes a portion of the Eagle Mine Superfund site that has been identified for potential residential development. EPA and the Colorado Department of Public Health and Environment are currently working with a development company, Battle North, LLC, to complete environmental investigation and cleanup actions necessary to allow for future residential use. In 2017, EPA selected a remedy for this area to achieve the additional cleanup of surface soils to levels that would allow for future residential development. These actions will include the excavation, containment and disposal of soils at a solid waste facility, the installation of a soil exposure barrier, and the implementation of institutional controls. The 235-acre Eagle Mine Superfund site is located one mile from the town of Minturn and 75 miles west of Denver and is bordered by the White River National Forest. The Eagle River runs through the site. Gold, silver, copper and zinc mining and production took place on the site at various times between the 1880s and 1984 leaving high levels of metals in soils, surface water and groundwater. EPA placed the site on the NPL in 1986. To date, cleanup has included the removal of contaminated soils and sediments, containment of mine seepage and runoff, monitoring of surface water, groundwater, pool water and stream water, and land use controls. These actions have achieved significant water quality improvements in the Eagle River, an important recreational asset and a now-thriving trout fishery. The U.S. Environmental Protection Agency (EPA) and the Colorado Department of Public Health and Environment (CDPHE) have released two final Records of Decision for environmental remediation at the Eagle Mine Superfund Site in Eagle County, Colorado, following the consideration of input received through a public comment process. Both documents, specifying measures to protect water quality and facilitate site reuse, focus on further reducing exposure to heavy metal contamination created by nearly one-hundred years of mining activity at the site. The amended Record of Decision finalized for Operable Unit 1 (OU1) at the Eagle Mine Superfund Site adopts site-specific arsenic remedial goals and modifies surface water cleanup levels for cadmium, copper and zinc to meet more recent standards established for the site by the Colorado Water Quality Control Commission in 2008. Water quality monitoring in the Eagle River indicates that these standards for cadmium, copper and zinc are not attained in March and April of most years. The OU1 Record of Decision requires institutional controls to protect existing remedial features and expands the current groundwater collection system in Belden and at the mouth of Rock Creek to further reduce metals loading to the Eagle River. EPA and CDPHE have also finalized a separate Record of Decision for Operable Unit 3 (OU3) focused on soil remediation necessary to protect human health should future residential development occur. EPA created OU3 after a developer purchased a large portion of the Eagle Mine Superfund Site in 2004 with plans to develop the property into a private, residential community. The Record of Decision for OU3 includes a combination of the following elements for areas proposed for development: excavating soil; placing a soil exposure barrier; grading the site; placing institutional controls and conducting monitoring; and/or demolishing structures. The Eagle Mine Superfund Site is located in Eagle County, Colorado. The site is defined as the area impacted by past mining activity along and including the Eagle River between the towns of Red Cliff and Minturn. Mining activities at the Eagle Mine began in 1879 and continued until 1984. EPA listed the site on the National Priorities List (NPL), commonly known as the list of Superfund Sites, in 1986 because of the mine metals discharge, uncontrolled mine waste piles and the close proximity of the population to the mine and associated features. To better manage the site, EPA divided it into operable units. EPA and CDPHE issued a final Record of Decision for the Eagle Mine Superfund Site in 1993. Over the years, all required environmental cleanup work has occurred at the site under a number of state and federal directives. EPA declared all cleanup construction activities complete at the site in 2001. Remediation conducted to-date has resulted in significant improvement in water quality and reduction in risk to human health and the environment. Continued operation of the existing remedy, including drawdown from the mine pool and treatment at the water treatment plant, is required to maintain this condition. Contaminant concentrations in surface water and groundwater have decreased significantly, and the aquatic ecosystem continues to show signs of recovery. Long-time residents of the Eagle Valley remember a time nearly 30 years ago when the Eagle River ran orange. Linda Jones, who worked at Battle Mountain High School, would pass by the river and its orange-stained rocks on her way to work, football games, and ski practices. Joe Macy and his colleagues at Vail Resorts (then Vail Associates) dealt with blowing orange snow on Beaver Creek’s ski slopes in the winter of 1989-90, as their snowmaking process pulls water straight from the Eagle. Those who weren’t around in the eighties might not realize that the scene at the Eagle River was not unlike the 2015 Gold King Mine spill on the Animas River. The leaching of hazardous heavy metals into the lifeblood of the Eagle Valley eventually caused the mining area to be declared a Superfund Site by the U.S. Environmental Protection Agency in 1986. Gold and silver mining activity in the 235-acre area dates back to the 1870s, until lead and zinc mining took over in 1905. Ownership of the operation changed hands multiple times, until 1984, when the mine operator, Glenn Miller, went into bankruptcy and failed to pay the electricity bills. Without electricity, the water pumps in the mine stopped running and the mine workings began to flood. For the next five years, the water level in the mine continued to creep higher, until finally spilling over and flooding the river with lead, cadmium, copper, arsenic and zinc. Water quality began suffering long before the spill, however, as up until the Clean Water Act of 1972 was enacted, discharging contaminated water into the river was a perfectly legal and common practice. The State of Colorado and the EPA both filed separate lawsuits against the former and current mine operators resulting in the cleanup being governed by two settlement agreements. Today, the site is owned by Battle Mountain, but the successor of Gulf + Western—CBS Corporation—is still paying for the cleanup and will continue to in perpetuity. Over the past three decades, multiple agencies and partners have worked together to remediate, monitor, and improve the cleanup and the Eagle River. In many ways, the Superfund Site is an example of a very successful remediation in Colorado. Ore was originally processed through roasting and magnetic separation, resulting in metals-laden roaster waste. The tailings from the milling process also contained high concentrations of metals and were slurried through a pipeline away from the mine area. The deposited waste led to acid mine drainage. To date, all of the roaster waste and tailings that threatened human health and water quality have been consolidated from the old tailings pile, capped with a protective cover and revegetated to prevent any further groundwater contamination. Contaminated groundwater is currently treated at a water treatment facility before entering the river. Institutional controls and monitoring were established around the waste rock piles to determine acid generation potential and the water quality impact from runoff. The EPA also created secondary cribbing walls beneath Belden as a safeguard from waste rock crumbling into the Eagle. Though extensive remediation has occurred on site, the primary remaining concern is water quality and the ecological risks to fish and the tiny aquatic insects they feed on. 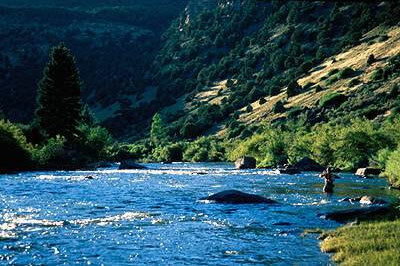 The Eagle River is currently being managed as a brown trout fishery under Colorado Parks and Wildlife. In 2008, the Colorado Water Quality Control Commission set new standards for cadmium, copper, zinc, and arsenic levels. The change in standards required a new “feasibility study,” a Superfund process for the development and evaluation of new plans for cleanup. Today, the need for further cleanup is clear as the metal levels tend to exceed limits in March and April, as the snow is melting at the Eagle Mine site but the river hasn’t hit peak flow yet. It’s important to note while arsenic levels peak in the spring, they are still well below limits for safe consumption of fish. The highest arsenic level is about .31 micrograms per liter (ug/L), while the Colorado Department of Public Health and Environment sets the standard for safe fish consumption at 7.6 ug/L, and under the Safe Drinking Water Act the limit is 10 ug/L. At a recent panel discussion of the Eagle Mine, both project managers from the EPA and CDPHE said they would let their kids and pets play in the river, and eat a fish from it as well. The EPA broke the site into three manageable operable units (OUs): OU1 deals with site-wide water quality; OU2 is concerned with human health, primarily in the town of Gilman; and OU3 encompasses the North Property Redevelopment, or the Battle Mountain Project. The EPA and CDPHE have recently released Proposed Plans for Operable Units 1 and 3, which can be found online here and here or at the Minturn Town Hall. These new plans outline different alternatives for future remediation of the Superfund Site, to both bring metal concentrations into compliance in the spring as well as address land use changes in the future. Public comments on the plans will be accepted until September 10th of this year and can be submitted by email or mail—the addresses for each can be found within the plans. As these Plans are the first step in determining the next actions in the ongoing cleanup of the Superfund site, the Watershed Council encourages the community to read the plans and provide comments. @EagleWatershed: History & Future of the Eagle Mine Panel Discussion on August 1st! 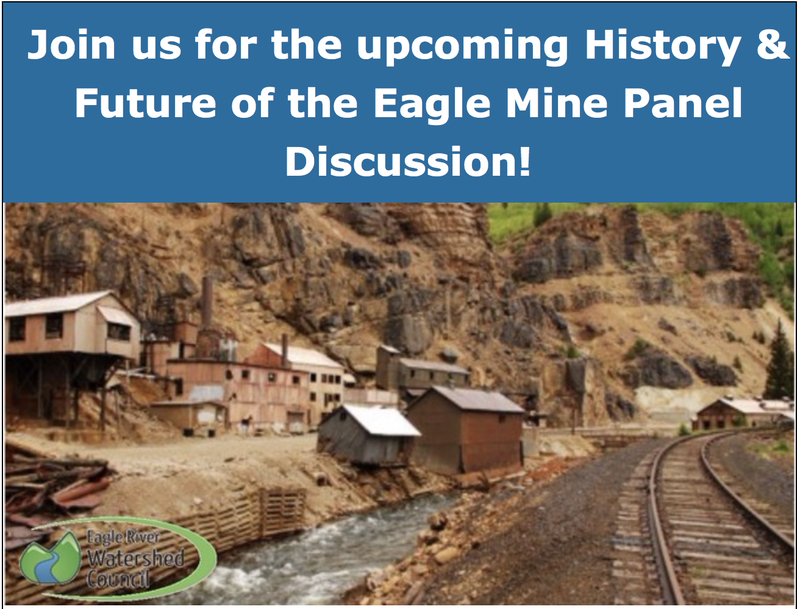 History & Future of the Eagle Mine Panel Discussion on August 1st! Don’t miss out on our panel discussion with Vail Symposium! This panel will explore the history of the Eagle Mine and the collaborative cleanup efforts of the past two decades. The discussion will highlight the business, operational and regulatory perspectives, as well as those of our local community. This discussion will be moderated by Larissa Read, president of the board of directors for Eagle River Watershed Council and owner of Common Ground Environmental Consulting. Jamie Miller is a remedial project manager with the U.S. Environmental Protection Agency. She has a B.S. in Environmental Science, with a focus on Planning and Administration. She began her career in the environmental field with a private consulting firm and spent six years working with the EPA as a contractor on the Superfund Technical Assessment and Response Team contract, providing technical assistance to the EPA Emergency Response and Removal Program. Wendy Naugle, P.E. is an engineer and groundwater hydrologist in the Superfund/Brownfields Unit at the Colorado Department of Public Health and Environment and has been working on the Eagle Mine cleanup for the past 18 years. Naugle holds a Bachelor’s degree in Geology from The Colorado College and a Master’s degree in Geological Engineering from the Colorado School of Mines. John Widerman is a member of the Minturn Town Council. He has lived in the Eagle Valley for nine years and in Minturn for six of those years. He is a local environmental steward, a Colorado Mountain College Alum and an employee of Eagle County Schools. The U.S. Environmental Protection Agency (EPA) and the Colorado Department of Public Health and Environment (CDPHE) today released two Proposed Plans for environmental remediation at the Eagle Mine Superfund Site. Both Proposed Plans focus on further reducing heavy metal contamination created by nearly one hundred years of mining activity at the site. The Eagle Mine Superfund Site is located in Eagle County, Colorado. The site is defined as the area impacted by past mining activity along and including the Eagle River between the towns of Red Cliff and Minturn. Mining activities at the Eagle Mine began in 1879 and continued until 1984. EPA listed the site on the National Priorities List (NPL), commonly known as the list of Superfund Sites, in 1986 because of the mine metals discharge, uncontrolled mine waste piles and the close proximity of the population to the mine and associated features. To better manage the site, EPA divided it into operable units (OUs). OU1 focuses on protecting surface water by reducing metals loading from the site to the Eagle River. OU2 focuses on potential human health risks from contaminated soils in the abandoned company town of Gilman. OU3 focuses on soil remediation necessary to protect human health due to planned future development by the current landowner. EPA issued a final Record of Decision (ROD) for OU1 in 1993 and a final ROD for OU2 in 1998. Over the years, all required environmental cleanup work has occurred at the Eagle Mine Superfund Site under a number of state and federal directives. Response actions at the site addressed the major sources of metals contamination to the Eagle River, including the old and new tailings pile, rex flats and various roaster waste piles near Belden. In 2001, EPA declared all cleanup construction activities complete at the Eagle Mine Superfund Site, except for ongoing operation and maintenance of remedial features like the water treatment plant. Remediation conducted to-date resulted in significant improvement in water quality and reduction in risk to human health and the environment. Continued operation of the existing remedy, including drawdown from the mine pool and treatment at the water treatment plant, is required to maintain this condition. Contaminant concentrations in surface water and groundwater have decreased, and the aquatic ecosystem continues to show signs of recovery. In 2009, water quality standards established by the Colorado Water Quality Control Commission specifically for the Eagle Mine site became effective. Water quality monitoring in the Eagle River revealed that the water quality standards for cadmium, copper and zinc are not attained in March and April of most years. In response, the Proposed Plan released today for OU1 describes a number of alternatives designed to further reduce metals loading to the Eagle River. The preferred OU1 alternative includes the collection and treatment of groundwater from Belden and at the mouth of Rock Creek. The Proposed Plan for OU3 presents cleanup alternatives focusing on soil remediation necessary to protect human health should future development occur. EPA created OU3, after a developer purchased a large portion of the Eagle Mine Superfund Site in 2004 with plans to develop the property into a private, residential community. The preferred alternative includes a combination of the following elements for areas at OU3 proposed for development: placing a soil exposure barrier; grading the site; placing institutional controls and conducting monitoring; and/or demolishing structures. community. It is important that the visitors and residents of Eagle County understand this, and also understand the threats to and condition of our watershed, especially as the population grows. The more each of us knows about the issues affecting our watershed, the more able we are as a community to take steps as needed. At the policy making level, awareness will help our representatives make educated and responsible decisions. progressive environmental attitudes toward the watershed. 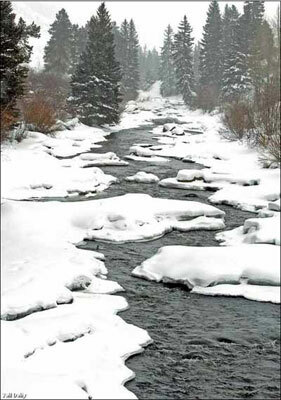 Deserving recognition at year end is the town of Vail for its efforts along Gore Creek. 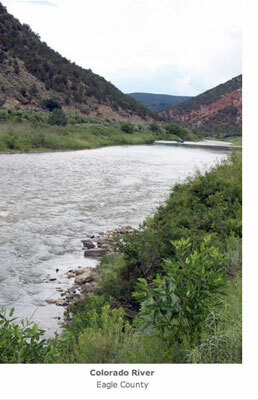 The town of Vail is committed to improving the health of its gold medal stream. In 2015, Vail completed the Gore Creek Water Quality Improvement Plan and has moved forward with the implementation phase of the program. Key components of the plan are to revise land-use regulations, repair damaged sections of the riparian zone and work with Colorado Department of Transportation to improve stormwater runoff systems near Interstate 70. Vail has identified 42 restoration projects and 61 stormwater runoff enhancements. Eagle River Watershed Council is excited to be working with the town of Vail to implement revegetation projects that will serve as examples of beautiful, river-friendly landscaping. The Watershed Council will continue to lead the Urban Runoff Group to create similar action plans for downstream communities. While the images from the Gold King Mine Spill shocked us, the reality is that amount of acid mine runoff is spilled into Colorado’s mountain streams every two days from thousands of abandoned mining sites. We’ve seen what the Eagle Mine is capable of doing to our river when left unchecked. In fact, this is where the Watershed Council has its roots. Every minute, 250 gallons of acid mine runoff flow into a water treatment plant in Minturn created solely for the treatment of Eagle Mine water. The plant removes an astounding 251 pounds of metals each day. The Watershed Council’s diligent efforts have held the responsible party accountable and have helped to develop a strategy to prevent a major event like the one in Silverton. The Basin of Last Resort has been a problem for years. This is the pond on Vail Pass which catches traction sand from I-70 and prevents it from migrating into Black Gore Creek, a tributary to the Gore. The basin has reached a critical level more than once, and the permitting process to remove the sand has been cumbersome in the most bureaucratic sense. 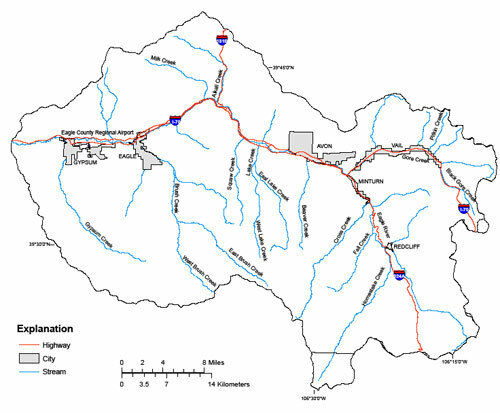 The Watershed Council is helping CDOT to design and implement a plan that allows more efficient access to the basin so that it can be cleaned more regularly. This approach will likely not be implemented until 2017, but the end result will be a long-term solution. The Watershed Council is fortunate to have an incredibly-competent staff, expert consultants and a compassionate board of directors to guide it. But it is the support of the Eagle County community that allows us to succeed; the individuals and businesses who donate, the municipalities, the volunteers. We have a dedicated and reliable group of people who regularly attend our events. We thank you for your continued participation and want to let you know that there is always room for more. Please join us as a volunteer or at our Watershed Wednesday educational series, where we discuss and dissect relevant water topics. Also, if you share our values, then please donate or contact us about aligning your business with the Watershed Council’s Business Partner Program.